Saint Paulin is a creamy, mild, semi-soft French cheese made from pasteurized cow's milk, originally made by Trappist monks. It is a buttery cheese, but firm enough for slicing. 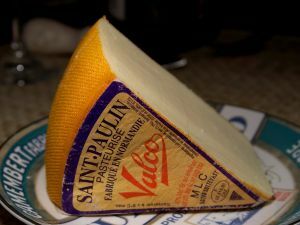 Saint Paulin is similar to Havarti and Esrom, and is suited to serving as a table or dessert cheese; it is often served with fruit and light wine. Genuine Saint Paulin has an edible yellow-orange rind. It is ripened in a round loaf with slightly protruding sides, and matures in about four weeks.